/ Disney Grand Floridian Resort Hotel – Which Are The Best Rooms? The Disney Grand Floridian Resort Hotel is the jewel in the crown of all the deluxe Walt Disney World resorts. You really can’t beat the location and the luxury of the Grand Floridian which is located on the shores of the Seven Seas Lagoon, very close to the Magic Kingdom, with access by boat and monorail. The Magic Kingdom is so close you can even walk there from the hotel. It is truly a luxurious experience to stay at the Disney Grand Floridian Resort Hotel and all of the rooms are fabulous. But some rooms locations at the Disney World Grand Floridian are better than others and it is good to get to know a little more about the hotel before your stay. 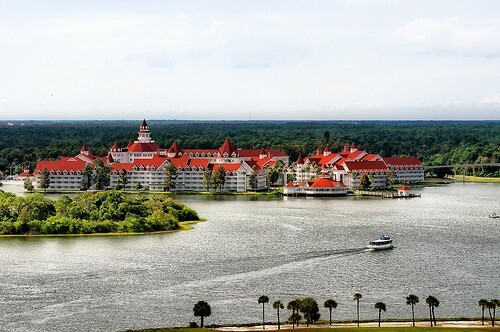 The Disney Grand Floridian Resort Hotel has a main building and 5 other rectangular buildings located around the resort. The resort is large and spread out over 40 acres of beautifully manicured space. The hotel has 867 guest rooms. Most are a very generous 440 square feet with two queen beds. Almost all of the rooms have balconies. The dormer rooms on the top floor have smaller balconies, but many guests like these rooms as they have vaulted ceilings. The main building at the Grand Floridian houses the restaurants and stores. It is also very close to the monorail stop. All of the rooms in the main building are concierge rooms. If you want to be close to all the amenities including the monorail and the bus stops with transportation to all the Disney parks this is a great choice. In the main building the best rooms are the ones which overlook the lagoon with a view of the Polynesian Resort in the distance. These are rooms 4322 to 4329 and 4422 to 4429. 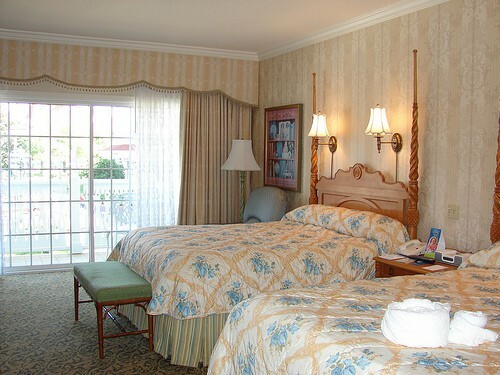 Very sought after rooms in the main building of the Grand Floridian are rooms 4401 to 4409. These have a fabulous view of Cinderella Castle. If you are dreaming of one of the best view in any Walt Disney World resort hotel room then this is it. The Conch Key Building there are rooms facing the lagoon. Of course the most popular are the Cinderella Castle view rooms. The best here are 7228 to 7231, 7328 to 7331 and 7425 to 7431. Boca Chica and Big Pine Key buildings also have good lagoon views. The best are the lagoon views on the first, second and third floors. The majority of the Magic Kingdom view rooms are found in Boca Chica. Be aware though that there are some not so great views in these buildings. There are some which face a building are are obstructed – try and avoid these if possible and ask the Cast Member on the desk to double check you are not getting these rooms. If you want to t be closest to the pool Big Pine Key is a good choice too, particularly if you are staying at the resort with children. Sago Key is perhaps the quietest, most romantic building, as many of it’s rooms have views over the marina. Whilst these views are not as spectacular as the Magic Kingdom views the are extremely nice. There are some views in Sago Key which have a view of Magic Kingdom. These are 5139, 5144, 5145, 5242 to 5256, and 5342 to 5345. The fifth building is Sugar Loaf Key which has concierge rooms only. Sugar Loaf Key faces Sago Key. Rooms either have a pool, marina or a wooded area. Whichever room you choose at Disney Grand Floridian Resort Hotel you are sure to have an amazing experience. Luxury in the heart of all of the Disney magic. But you will feel at home, even in your Mickey Ears and Goofy shirt! Have you ever stayed at The Grand Floridian? Share your experiences with us by leaving a comment below.